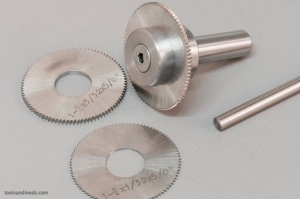 Homemade screw slotting slitting saw arbor for 5/8" bore screw slotting saws. Has a straight shank, 35 mm long and 12 mm in diameter. Designed for use on ER32 collets. Cap and blade secured by a single M6 screw.